Courting Success: Head Tennis Coach James Helvey high-fives two of his players during a break in their match. Helvey announces his resignation after spending more than two decades with Cameron. 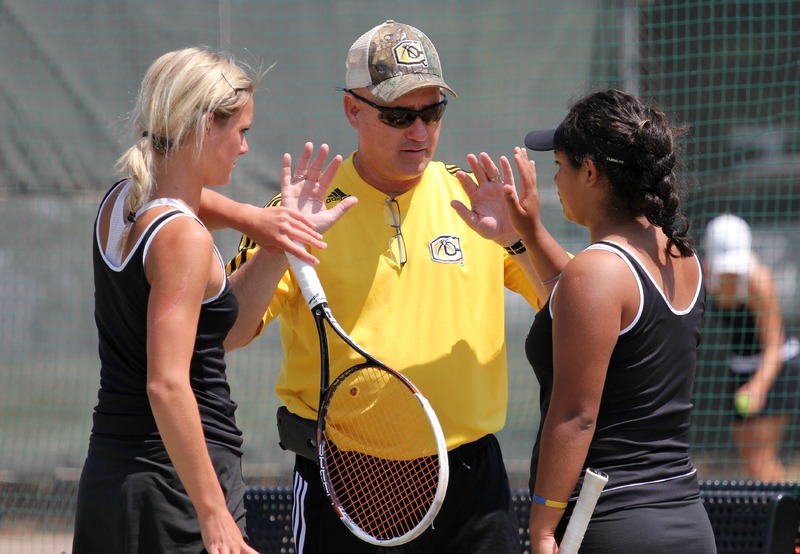 On Jan.11, head tennis coach James Helvey officially announced his resignation, ending his 24-year career at Cameron University. Helvey started his coaching legacy at Cameron in 1993 as the head of the men’s tennis program. In 1999, he took the reins of the women’s tennis program following the resignation of former women’s tennis head coach Joe Jones. 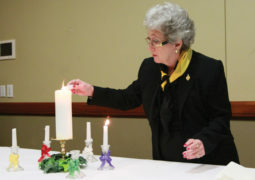 Over those two-and-a-half decades, Helvey has ended each season with winning record for both the men’s and women’s teams. As the men’s head coach, Helvey’s team has appeared in the NCAA South Central Regional Championships 21 times, winning the title in 2008 and 2013-16, advancing to the NCAA National Tournament where the Aggie men made it as far as the Elite Eight in 2015. As the women’s head coach, Helvey recorded 13 visits to the NCAA postseason, winning the Regional Title in 2011, 2012 and 2016. In his last season with CU Tennis, the Aggie women advanced to the Elite Eight in the NCAA National Tournament, where he claimed his 800th career win. 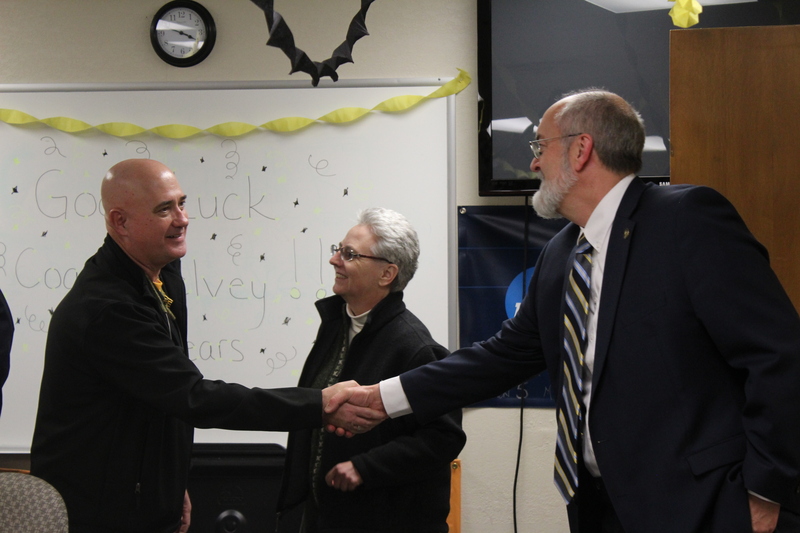 In recognition of Helvey’s accomplishments, the CU Athletic Department held a reception from 3-5 p.m. Jan. 12. During the reception, close friends of Helvey, students, faculty, President John McArthur and Dr. Karla Oty joined Aggie tennis supporters to bid the long-time coach goodbye. Helvey gave thanks for everyone’s support. He explained his reasoning for taking a job as Head Tennis Professional at the Arlington Tennis Center and leaving Cameron so suddenly. “The opportunity presented to myself to go in a little bit different direction as a career,” Helvey said, “but it also presented as a chance for me to get back near my home where I grew up. My family is there and my parents, who I want to be able to help take care of. Also, Helvey expressed that though he may be retiring as head coach, he isn’t cutting ties with Cameron Tennis. Helvey also said his support for Cameron mostly shows itself through his coaching and molding of players into successful students and well-adjusted adults. Because he focuses on growing his players as people, Helvey said the reputation of Cameron Tennis is respectable, and he hopes the next coach maintains the teams’ integrity. Helvey had one final message for his student-athletes, reiterating a lesson he teaches to them from the very start of their time in the tennis program.